California Stainless top of the line sinks represent the highest quality on the market. The most desirable premium sink sold results from our superior workmanship and use of heavier gauge material. Drain located in the rear corner unless different location specified. Sink pans are heavy duty 16 gauge type 316 LC stainless steel with coved 1/2" radius interior and exterior corners. Heliarc welds are ground, polished, and passivated forming seamless construction. The 1¼" box type lip around outside edges provides an extremely rigid sink. Sink bottoms are insulated with sound deadening and anti condensation material. 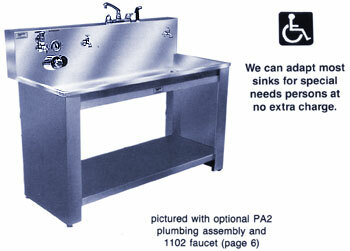 Sink pans are removable from Sink Stand, providing access through narrow doorways. Sinks and stands are shipped assembled, eliminating time consuming assembly on job site. © 2016 California Stainless Manufacturing, Inc.